Please see article on “Canines, Wild and Tame” written by JoLynn Taylor of WildCare. She states that “dogs and coyotes don’t like each other.” This information is fundamental and needs to be known and understood by all dog owners so that they may act in their own and their dog’s best interest by keeping these two canines well apart. Please read about how easy it is to coexist with wildlife by simply following logical guidelines posted at the top of this blog. I’ve been fighting to preserve wildlife habitat in our parks for a long time. This includes thickets, forests and underbrush, all of which are being removed and thinned as part of the present “native plant” craze. The native plants of California include mostly low lying grasses and dune plants. Those of us who care about the furry critters which inhabit non-native thickets have not been able to do too much about it. This is because furry critters are on no “endangered” lists. What IS on the endangered list are butterflies and damselflies. So habitats for them take precedence over what already is in place for harboring furry critters. I think we all would like to see native plants preserved and prosper, but the program in our area is much too extreme: entire forests and thicket areas in our various parks are being removed simply because they are not native — even though they are beautiful and serve as habitats. They are being removed in favor of planting fragile native plants which provide little if any harbor for our furry wild critters. Here are a couple of articles, finally, backing what I have been advocating for so long! Also a couple of superb blogs loaded with relevant information on this same issue, and an analysis of the Scientific American article. In this posting, you have three different sets of interactions — each row across is a different set. In the first row, the dominant sibling approaches the more submissive guy. He displays his dominance initially by urinating. Then he approaches as overpowers the submissive guy. In the last slide of the first row, notice that Mom is calmly watching from the sidelines. In the second row there is a display of oneupmanship by the dominant sibling. But then they seem to hunt together: each totally interested in what the other is doing. In the last photo of the second row they look like they are hunting peacefully side by side. In the bottom row, the sequence begins with all three coyotes watching an onlooker and a dog-walker team in the distance. Then the dominating sibling, with hackles and tail up, approaches the less dominant fellow, who, in the last slide, runs off with head down and ears back. A family of three interacts in their habitual manner. In the top two rows, the submissive sibling is in the middle, with Mom on the right and the dominant sibling on the left. The submissive fellow keeps his ears back and somewhat together. He’s the one who puts his paw up on the dominant sibling in supplication: “hey, take it easy.” The last photo of the middle row shows Mom reacting angrily to the dominant sibling, and he, in turn, reacting to her — each bares their teeth viciously, but only for show, for communicating feelings. This altercation ends quickly. Bottom row: the submissive sibling, now in the middle, tries to assuage Mom’s anger. In the middle slide, this submissive fellow has moved to the right keeping a vigilant eye on the dominant sibling to the left — notice his eyes. In the last slide, with Mom safely off to the far right, the bullying sibling in the middle feels free to go after the more submissive fellow who snaps back. They all then moved apart and there were no more interactions. Here, Mom and one of her offspring, the more submissive of two siblings, watch dogs approaching in the distance — a common coyote activity. 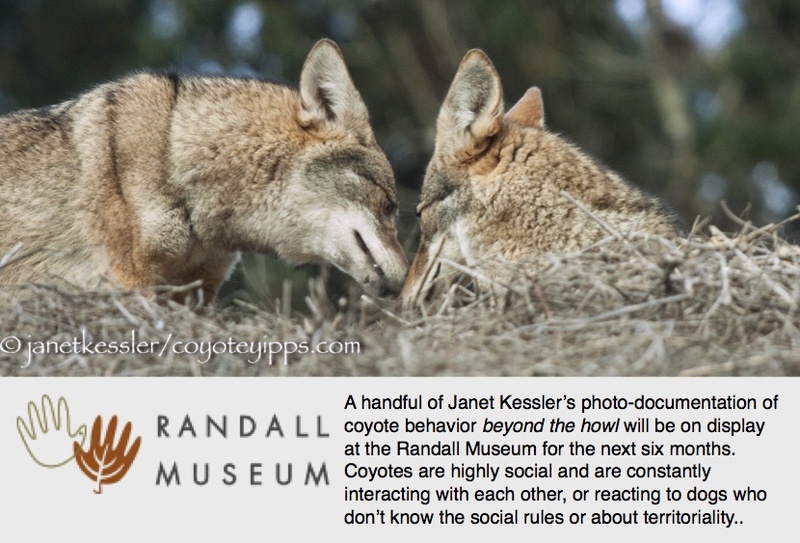 At one point, the offspring looks intently at Mom: visual communication is common — coyotes read each other through eye contact, expressions, and body language. When the more dominant sibling approaches — he’s the one standing to the right in slide #3, the more submissive sibling heads off about 50 feet and sits in the distance with his ears down — a submissive sign showing that he is not a threat. He does not want to tangle with his more dominant sibling. At twilight Monday I saw the larger of the two youngsters in my coyotes’ Los Angeles area field. It was the third sighting over three consecutive days. Each time she was apparently alone. I watched her from the river bank on both Saturday and Sunday. Both of those days she was in transit on her north-south dirt road. Saturday I was with Holtz, my friend and her German Shepard. The youngster came from the east, arrived at the north-south road and turned south. Upon spotting us, the youngster sat and stared until we left. Sunday, before twilight, she came into view traveling north on the dirt road. She saw Holtz and me standing on the river bank. She seemed more relaxed. After a few minutes she even pounced for a rodent, probed for it, but with no luck. Eventually she headed north and took a dirt road to the east. Monday Holtz and I arrived before twilight and stood on the dirt road looking south. At twilight I saw her headed towards us on the that dirt road. She stopped, stared straight at us, looked to her right and yawned. She then came directly towards us, stopped about 100 feet away and marked. She kept that distance, investigated the area around her and then headed west to stand atop a pile of large rocks. She then trotted south, going past the road that heads east. As we left I saw her quickly going east on that road, having doubled back to do so. This young female is about nine months old. A few months ago in similar encounters, accompanied by her mother and father, she didn’t seem to have a clue about how to handle Holtz and me. At that time her parents behaved much as she did today. Her parents were assertive, yet the youngster was either playing or scared and seeking safety either from her parents or from flight. Monday she seemed as self-directed, assertive and purposed as an adult coyote.